In my ‘Women in History’ post about Anne Neville, I commented that she was one of the women of history most grievously misrepresented by Shakespeare. There is a good argument for Margaret of Anjou being another. Margaret was the wife of Henry IV and the mother of Edward of Westminster, Prince of Wales, who married Anne Neville. Shakespeare paints Margaret as a bitter and twisted old woman who hung around the castle and served everyone with a vitriolic curse or two before breakfast every morning. Of course, Shakespeare was not one to let the truth get in the way of a good story or a really effective dramatic device. He was all about the entertainment— and on sucking up to Elizabeth I by portraying her grandfather as the king who brought peace to England after the Wars of the Roses. It’s understandable, really. Not only was he working from accounts of history written by Tudor-friendly historians, he also understood how foolhardy it would be to offend the reigning monarch and risk his head. Thus, his play casts the first Tudor king, Henry VII in a very godly light, and delivers messages to the masses about how only evil people try to take the throne from the rightful ruler. It is a matter of course, then, that both the Yorks and the Lancasters are shown to be fractious, grasping and hateful people. What, then, is the real story of Margaret of Anjou? Margaret was born in 1430 to the Duke of Naples, Rene of Anjou, and his wife Isabella, Duchess Of Lorraine. As the niece of the queen of France, the arranged marriage of Margaret to the young Lancastrian king in 1445, and solidified a truce between France and England that brought an end to the Hundred Years’ War. Margaret took an active role in supporting Henry IV in his rule, but when his mental health declined, Richard, Duke of York, who held significant position and power at court was appointed as Lord Protector. Margaret and York distrusted one another’s pride and ambition, she because she feared he would claim the throne that rightfully belonged to her husband and son, and he because he deeply disliked the self-assured and proud young French queen. Enmity blew out into full conflict in 1455, and the two factions met on battle at St Albans. Henry VI’s forces were defeated, and Richard took the reigns of government. Henry VI’s mental and physical health had deteriorated to the point where he was unable to govern, so Margaret, determined to maintain hold on the throne for her husband and son, worked relentlessly to remove York from his position, finally regaining control of the throne in 1456. By 1459, the situation had degraded so badly that Margaret outlawed York and his key supporters, and armed conflict could no longer be avoided. Henry VI was captured at Northampton in 1460 and, when offered a compromise that would see York declared to be Henry’s heir instead of her son, she steadfastly refused, maintaining that her son was the only rightful heir to the throne of England. Margaret’s soldiers killed York near the Yorkshire town of Wakefield in the December of 1460 and won Henry’s release from Yorkist captivity at the second Battle of St. Albans in February of 1461. This was not the end of the conflict, however. York’s sons and supporters continued to fight, and his eldest son Edward of York laid claim to the throne as Edward IV on March 4. His army met and crushed Margaret’s forces at the Battle of Towton on March 29, causing Margaret and Henry to flee to Scotland with their son. By 1470, Warwick the Kingmaker had become disillusioned with Edward IV as king and commenced machinations to lead a coup against Edward and return Henry IV to the throne. Although there had been strong enmity between them, Warwick and Margaret negotiated a reconciliation arrangement by which Henry was restored as king in October of 1470, and his son Edward was married to Warwick’s daughter Anne Neville to seal the deal. It was only a matter of months before Edward’s soldiers killed Warwick in the Battle of Barnet on the on the 14th of April— the same day that Margaret, Edward and Anne returned to England from France. The two armies met again at Tewksbury on May 4th, 1471, with Margaret leading the Lancastrian forces in the absence of Henry, whose health had once again deteriorated. Edward dealt Margaret a crushing defeat and her son was killed. Shortly after that, Henry VI was put to death in the Tower of London. This final blow put an end to Margaret’s hopes to reclaim the kingdom, and she was taken into custody where she was held in various places including the Tower of London. She appealed to her father for help, but he refused, so she remained imprisoned until 1475 when the French king Louis XI negotiated her release and paid the ransom that enabled her to return to France.Margaret died in poverty in 1482. While I have no doubt that she did indeed weep and that she most passionately hated the Yorks, she certainly didn’t get a chance to lurk behind pillars in their castles and curse them face to face. She never saw Richard take the throne of England, nor was she a witness to the death of his wife Anne, her own former daughter-in-law. Both of those things happened in the year after her death. I love Shakespare, and I love podcasts. Let me show you where to find the best of both worlds. I love podcasts, and I love Shakespeare. In these four podcasts, you’ll find the best of those two worlds combined. #1: No Holds Bard. An informative and entertaining podcast by Dan Beaulieu and Kevin Condardo, directors of the Seven Stages Shakespeare Company in Portsmouth, New Hampshire. They discuss the plays, words that people in the 21st century might not know, different interpretations, and various performances of Shakespeare’s plays. They even have a segment where they’ll answer homework questions sent in by students. You can follow on Facebook and Twitter. #2: Folger Shakespeare Library: Shakespeare Unlimited. A podcast that explores the associations between Shakespeare’s writing and the world today through the words we use, ideas we discuss, and performance of the works of Shakespeare and others. #3: Chop Bard – In Your Ear Shakespeare. This podcast explores different parts of the plays, offering insight and analysis in an interesting and accessible way. Find out more via the website or follow on Twitter. #4: My Own Shakespeare. This BBC podcast features different people discussing the piece of Shakespeare’s work that means the most to them. Each episode is about 3 minutes long, so it’s a nice little podcast to enjoy during a short break or over a coffee. Find out more via the website. Richard III’s Book of Hours. Anyone who knows me at all knows that I’m a history nerd. I love reading it. I love studying it. I love teaching it. And my favourite period of history, ever? Medieval Britain. So you can imagine my absolute joy when I learned that Leicester Cathedral has made a digital copy of Richard III’s personal prayer book, the ‘Book of Hours’, available to everyone, world-wide, absolutely free. Maybe they don’t realise that I, and many others like me, would have willingly parted with cold, hard cash for that. Needless to say, I went right over there and grabbed it. Included with the digital version of Richard’s Book of Hours is a commentary by historians Anne F. Sutton and Livia Visser Fuchs, which offers insight and explanations for the text. Richard III is possibly one of the most controversial English kings. He’s the one they dug up from underneath a public car park in Leicester in 2012, and re-buried in Leicester Cathedral in 2015. But that’s not why he’s controversial. Richard is the key figure at the centre of the “did he, or did he not?” debate about the demise of the ‘Princes in the Tower’. Of course, nobody really knows. There’s a lot of evidence that he was the most likely suspect, but there’s also a number of good arguments for other parties being responsible. The fact is, we’ll probably never know. Either way, the Tudors very cleverly had Richard portrayed in both history and popular culture as the entirely self-serving, greedy, murderous, deceitful and manipulative hunchbacked king who murdered his way to the throne and effectively stole the kingdom of England from anyone who was more entitled to it than he. That story was most famously perpetuated in Shakespeare’s play ‘Richard III’, which also caused him to be the most misquoted king of England ever. How many people actually believe that “A horse! A horse! My kingdom for a horse!” meant that he was willing to swap his kingdom for a horse, presumably with the intention of escaping on it? In actual fact, even in Shakespeare’s play, he was saying that if he couldn’t get a horse to replace his own, which had been killed in battle, he would surely lose his kingdom to Henry Tudor. As I’ve pointed out to my own students, if Shakespeare had actually thought of making him look that cowardly and heartless about his own kingdom, he might have written it that way, but he didn’t. The Tudor bias in both the recorded history and in Shakespeare’s play did mean that for the last 550 years or so, most people have quite happily assumed the worst of Richard. Richard’s Book of Hours suggests a different side to this man. Owning a prayer book is one thing; using it is another. Richard made personal notes in this book – a comment in the margin, a note about his birthday. Given the rarity of books at the time of Richard’s reign from 1483 until his death in 1485, one would be reluctant to write in a book unless they were actually using it. In some other similar books , there are occasional little notes written beside the text of the book by whichever priest was either writing or studying the text. We must understand, though, that it’s different than a teenager drawing winky faces next to the rude bits in Shakespeare. One such note we can be absolutely certain was added by Richard to this book is “dolor”, which means ‘grief’. Having experienced the death of both his only son and then his wife, Richard was indeed a man familiar with grief. When I consider the images of Richard’s Book of Hours, I think of a man who was conscious of his standing before God and who used this book daily. I think of the man contemplating his fate on the night before the Battle of Bosworth, where contemporary sources suggest he had a daily prayer book right there with him in his tent. He was a man who prayed. Those records also tell us that Richard participated in a service of Mass before going into battle. Obviously, I cannot vouch for his sincerity because I never met the man, but it does make one consider another perspective of this perhaps much-maligned king. After the Battle of Bosworth where Richard died and Henry Tudor became Henry VII of England, Richard’s prayer book was gifted to Henry’s mother, Margaret Tudor. She didn’t scratch Richard’s name out of the front of the book, but she did write a short poem in the back that stated the book now belonged to her. Thankfully, the book now belongs to Leicester Cathedral, who have generously shared it with all of us. Even in digital form, I find that very, very exciting. I’ve just self-published my first play! ‘The Shakespeare Omelette’ is a one act play in which four teens enact parts of different Shakespeare plays while waiting for their teacher. It has been road-tested on my drama class, who greatly enjoyed rehearsing and performing the play. The audience also seemed to enjoy it. The process of self-publication was new to me, so I hope I got it right! If you have any problems, please leave a comment here and I’ll try to sort things. It is my hope that it will soon be available in the iBooks store. In honour of two enigmatic and very talented princes of poetry and symbolism. My kingdom for a pencil! My drama class was rehearsing a play which includes excerpts from a number of Shakespeare’s plays. I am so very, very proud. I’ve just discovered and followed a wonderful blog where a contemporary pop song is reworked as a Shakespearean-style sonnet. By “just discovered” I mean that I followed a link that a friend posted, and ended up spending an hour there reading the sonnets. One might expect that the spirit or intent of the songs might be lost, but these sonnets remain true to the tone and message of the songs they are based on. I don’t know who the author is, but this poetry is absolutely brilliant. Not only is it clever poetry, it’s something that can break down the barriers between Elizabethan and 21st century English. I’m definitely going to use some of these with my classes. 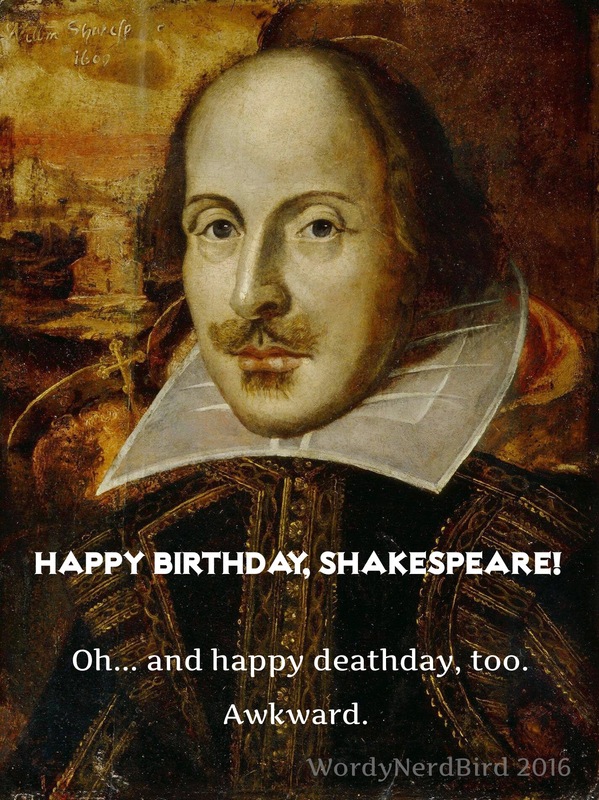 Happy 449th birthday, Mr Shakespeare! 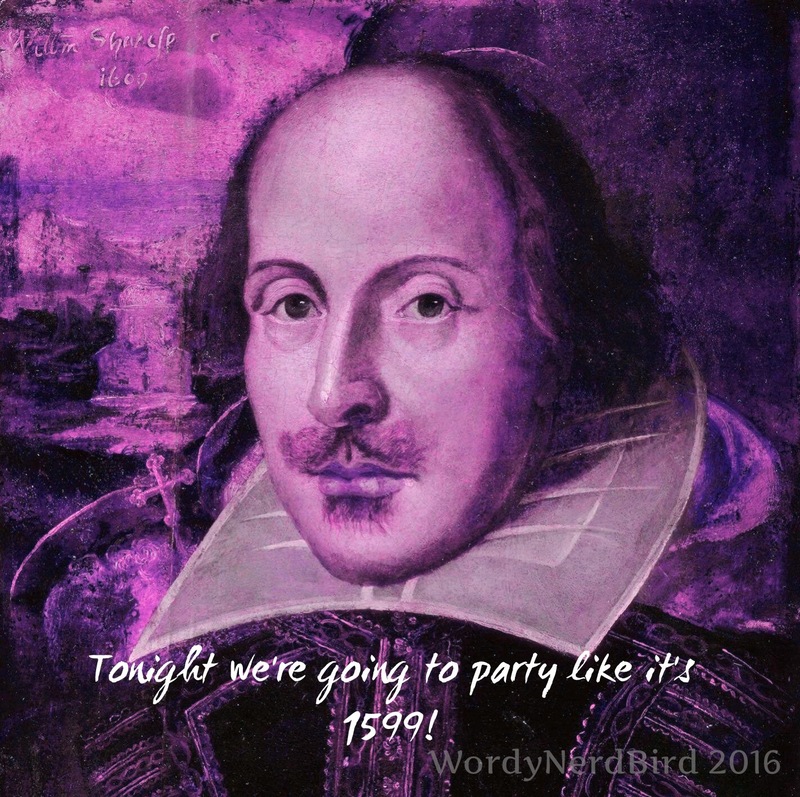 Very few of my friends understand my love of the works of Shakespeare. They’re not even interested in my explanations. I suspect they prefer to believe that I’m slightly crazy, or that I’m some kind of intellectual snob who talks about Shakespeare because I think it makes me look smart… or something like that. It seems to me, those friends of mine must have had very poor English teachers at school. The language is so beautiful. Shakespeare’s works express powerful ideas with clarity and passion. They provoke thought. They inspire discussion and debate. They touch on issues of the heart, the soul, and the human experience in ways that anyone can understand. The ideas that are the foundations of Shakespeare’s works are still so relevant today. Which of us living in the 21st century do not understand anger, love, jealousy, greed, fear, insecurity, loneliness, or wishing that life were different than the way it is? Which of us cannot learn from seeing someone else handle their situation the wrong way? When I teach one of Shakespeare’s texts in my classes, the key question I always bring my students to answer is, what does it mean? What message is Shakespeare delivering here? How would the Elizabethan audience understand it? How, and why, is that different than the way we understand it in the 21st century? Engaging in interpretation of a text like Othello, Macbeth or Henry IV part I is less intimidating than it seems. It doesn’t take a teenager long to work out that Iago is not only jealous but also both manipulative and vindictive. They have an instinctive understanding of the ways in which Hal displeased Harry, but also of the ways in which Harry must have frustrated and discouraged Hal. Young men are quick to work out that any modern girl whose attitude resembles that of Lady Macbeth is, in all likelihood, not the girl for them. It’s all about common human experiences and what lessons can be drawn from the actions and misfortunes of others. The art of interpretation is discerning what the lessons are and how they should be understood. This can only be achieved if the text is known well, and thought about, and discussed, and debated, and challenged with different perspectives. That’s what we do in my classes on Shakespeare.